First Line: It was the tail end of the morning when the charges were laid before me and I would tell you I was tempted to laugh at first, for the story was nonsense. Young Oswald de Lacy has barely begun to recover from the events in Plague Land, and he certainly hasn't had time to feel more comfortable in his new role as Lord of Somershill Manor when babies begin to disappear and the legend of the Butcher Bird surfaces. A newborn baby is found impaled on a thorn bush, and villagers report sightings of a huge creature in the sky. A grief-stricken man who lost his family to the plague is held accountable for calling the creature down upon the village, and Oswald has his hands full trying to keep the man alive while he investigates. It should come as no surprise that he gets absolutely no help from any of his men or his scheming sister (who's too busy neglecting her stepdaughters and fawning over her own newborn) or his mother, who seems intent upon poisoning everyone at Somershill with the foul concoctions dreamed up by her personal physician. Dare I say it, but the death of a baby seems a welcome distraction to Oswald de Lacy. Barely nineteen, he was never meant to be lord of the manor. Instead he was sent to a monastery at the age of seven to lead the religious life until his father and two brothers died of the plague. Now Oswald finds himself thrust into a job he has no training or aptitude for-- and at a time when the whole world is changing. Although the work load remains the same, there are so few peasants left to do it that they are realizing that they can demand higher wages. Naturally the nobility passes a law to prevent that, and Oswald finds himself caught in the middle. He wants to pay his people more money, but he's afraid of the spies who are roaming the countryside to check up on everyone. As Oswald begins to investigate the baby's death, he sees that-- once again-- fear + ignorance = hatred. Not only do his villagers not want to work for him, they have no intentions of being swayed from their belief in the Butcher Bird. As he struggles to find clues, we are taken on an up-close-and-personal tour of village life immediately following the ravages of the plague. It is fascinating, revolting, funny, and heartbreaking-- and Sykes makes us see and feel it all. I would imagine that some readers will find Oswald too weak to be the main character. I don't. It's his weakness that makes him perfect for the role. So what if he's not been trained for his role in life? So what if he doesn't seem to have any real aptitude for it? He is an intelligent young man who genuinely wants to do good, and he's taken over Somershill Manor at the precise time that the old world is changing. He's also a teenage boy filled with raging hormones and a fascination with himself. 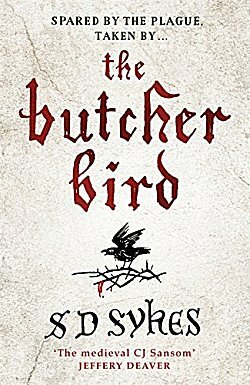 At the end of The Butcher Bird, one of the villagers looks Oswald right in the eye and says, "There is a butcher bird in Somershill." What I cannot wait to see is how Oswald assimilates that statement, and yes, that means I'm eagerly awaiting book number three. In this second book I found the mystery rather easily solved, especially if one uses the deductive powers of one's heart over one's mind. However, this is such a wonderful evocation of time and place that I can easily overlook something like that. (I do wish I could overlook de Lacy's mother and sister as easily, although I know that they represent the whining, complaining Chorus of Things Past.) Oswald has reached a turning point at the end of this book, and I want to see what he does next. Hmmm.....I do admire an author who can put you right there in a particular time and place, Cathy. Not sure I'm ready for a dead child, though. I may check this out, because it sounds quite well-written. But I'll have to wait until I'm ready for that. I can understand, although Sykes does handle it all in a very sensitive manner.